Parks and Recreation Department Director John Gentry will make requests for fee levels for park programs, and Utility Department Director Wayne Haynie will propose water and sewer rates. Items on the agenda for tomorrow night’s BOC regular meeting include second reading of a Door-to-Door Solicitation Ordinance, second reading of changes to the county’s Alcohol Ordinance, and a proposal for a transit van long sought by Coroner Ed Carson. The budget hearings begin at 5 p.m., starting with the Utility Department. The regular meeting, billed as an agenda-setting session, starts at 7 p.m. Both meetings are to be held at the Courthouse in Watkinsville. Originally, the Board of Commissioners was to review the budget requests for the Utility Department and the Parks and Recreation Department on April 19, the third day of budget hearings. Commissioners moved quickly through the sessions on April 17 and 18. Three of the items originally scheduled for April 19 were moved to April 18, and the remaining two–Utility and Parks and Recreation–were delayed until the newly scheduled session tomorrow. Commission Chair John Daniell said at the April 17 meeting that Haynie would be presenting new data on water and sewer usage and rates and would need extra time for that purpose. Under Commission Chair Melvin Davis, who retired at the end of last year, much of the budget negotiations took place before the budget hearings. At the hearings, department heads and constitutional officers then made their cases to the voting commissioners. Representatives of many of the departments did not even appear before the Board this year, with Finance Director Wes Geddings simply reviewing the requests on their behalf. Emil Beshara, director of the Public Works Department, noted at the meeting in April 17 how different the process was this year. Geddings noted at the beginning of the session on April 17 that the plan is for all county employees to get a cost of living allowance of 0.3 percent and that that figure was used in calculating all department budgets. In addition, the budgets include a 6 percent increase in benefits across all employees, he said. Most department heads requested only slight changes in their budgets from the year earlier. Geddings, Daniell and County Administrator Jeff Benko reviewed those requests and recommended increases and decreases in those figures. Coroner Carson did request once again a transport van, and that request was not included in the recommended budget--to Carson’s obvious disappointment. The agenda for tomorrow night’s meeting includes discussion of a used transport van being offered to the county by Lord and Stephens Funeral Home at a cost of $11,000. That figure includes a used stretcher. Jason Wommack from Lord and Stephens sent Daniell an email on April 17 indicating that he would “accept a payment of $5,000" and treat the remaining $6,000 as a charitable contribution. The Solicitation Ordinance before the Commission for second reading would require commercial solicitors to register and pay a fee before being granted permission to solicit. The law would not affect non-profit groups. Daniell said at the meeting on April 4 that final action on the two ordinances would be taken on May 2. Another agenda item is for a change order to increase the cost of a segment of the McNutt Creek sewer line from $3,395,298 to $4,215,298 to allow for construction of a tunnel under SR Loop 10 rather than the originally proposed bore. The Board also will consider bids for construction of a traffic signal at the intersection of Mars Hill Road, Rocky Branch Road and Virgil Langford Road. The low bid is for $98,357 from GBK Mechanical Inc. of Villa Rica on I-20 west of Atlanta. Under the policy Daniell has established, citizens are not able to comment on items on the agenda unless the Board takes action. The agenda does not designate items in advance as those on which the Board will take action, so it isn’t possible to know in advance whether citizen comment will be allowed on the budget items reviewed above. 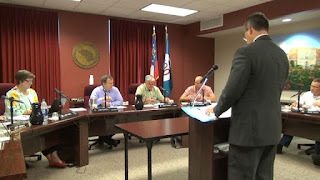 Videos of the budget hearings on April 17 and April 18 are on the Oconee County Board of Commissioners Channel of the Oconee County Observations Vimeo site. I recorded the session on April 17. Sarah Bell recorded the session on April 18. I edited the video to take out the dead time between presentations, but I did not eliminate any of the discussions of the budgets. NOTE: An earlier version of this story mistakenly identified Athens Ford as the party offering the van to the county, rather than Lord and Stephens. I misread the correspondence posted by the county for the agenda. I thank Chairman Daniell for calling the error to my attention and apologize for making it in the first place. Kudos to the Board for transparent discussions. P&R and Utility are indeed the most public interactions of County and us real people. Some interesting requests to watch. The Devil is very much in the details. How many years in a row have Utility Department water and sewer rates been increased? Isn't it something like 8 years in a row? How 'bout a decrease or keeping them flat for a year? What's that old saying about things that are always certain? Death, taxes, and in Oconee, your water & sewer rates increasing. The problem is that development requires infrastructure and infrastructure requires $$$. The $$$ must come from user fees or taxes. Water and sewer are funded through user fees so yes, fees especially for sewage capacity will have to increase because of increased need. So when you hear development will lead to lower taxes, remember those fee increases. Where are rates going down? Also compare your rates to other communities. 0.3%??? That seems really low. The COLA is based on the inflation index. The CPI-U actually was negative 0.3 in February to March comparisons. It was 0.1 in the January to February comparison. Water rates had increased eight years in a row up to last year.